"I'm from San Diego and these taste just like home! We live in the south now, and nobody has heard of these! Serve with homemade pico de gallo, and lime wedges to squeeze on top!" Dust fish pieces lightly with flour. Dip into beer batter, and fry until crisp and golden brown. Drain on paper towels. Lightly fry tortillas; not too crisp. To serve, place fried fish in a tortilla, and top with shredded cabbage, and white sauce. 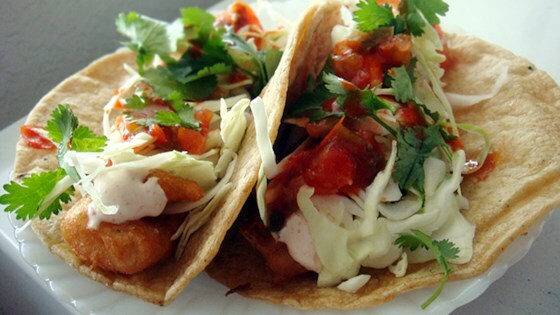 Crisp fish tacos bring the summer heat! I love this recipe !! If I don't have time to batter the fish I buy the frozen battered fish, bake it, and cut it up onto the corn tortillas. Quick and easy if your in a rush. Good recipe, trick with batter is do not whisk too hard. You must not break up the bubbles from the beer, otherwise the will become too bready and not puff up. Also, sauce needs a little salt.